In the late '60s, Jack Kirby began to get fed up with working at Marvel. He kept creating new characters, but he just tucked them away in a drawer until he quit and Carmine Infantino invited him to come work for DC, at which point all that backlog came pouring out. In 1971, three new Kirby books debuted: New Gods, Mister Miracle and the weakest of the bunch, Forever People. Mantis is a servant of Darkseid, ruler of Apokolips, the planet of ultimate evil, and his power may rival that of his master. When Darkseid sent Mantis to Earth to locate the Anti-Life Equation, the means to control all sentient life throughout the universe, Mantis schemed to conquer the planet himself instead. Cursed with an insatiable lust for power, Mantis would be just as happy to see Darkseid defeated as he would to see Apokalips triumph. The Forever People were basically superpowered hippies from outer space, who could join together to create Infinity-Man. Kind of like the Planeteers forming Captain Planet, or the Eternals forming the Uni-Mind (which goes back to that thing about Kirby copying himself). Anyway, issue #2 of the book introduced the energy-vampire Mantis, a bug (yes, a literal insect) from the planet New Genesis who raised an army and tried to invade Earth. 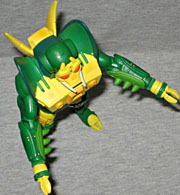 Mantis uses the large male body, though he gets new forearms, shins and feet. Not only do they have plug-holes to accommodate the cape (more on that down in the articulation section), they also feature a fully sculpted overlapping armor texture. 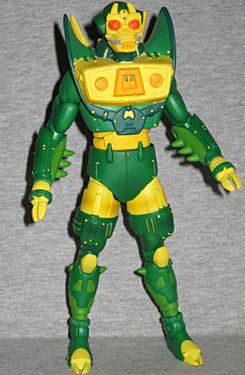 Come on, admit it: you're shocked Mattel didn't try to just paint the armor on there, aren't you? Now, make no mistake - a lot of the costume details are simply painted, but those would probably just be patches of color on a "real" outfit. 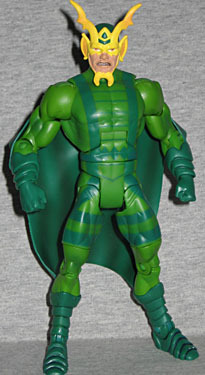 The base color is light, limey green, with darker gren stripes and diamonds all over the chest and legs. The head is unmistakably a Jack Kirby creation: it's monstrously ugly and ridiculously baroque. 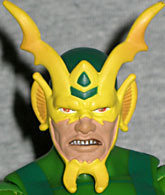 Mantis wears a dark green skullcap with a yellow mask that exposes only the nose, mouth and cheeks. He's showing his teeth as he frowns, and the paint is clean enough to capture all the detail. The mask looks like a cross between an earwig and an elk, with ears that seem to be either gills or goldfish fins. This thing truly is an abominable mess, but it's also accurate to the comics. 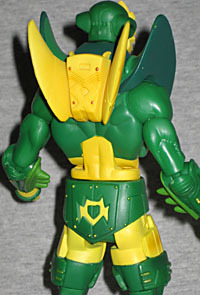 Mantis has the usual DC Classics articulation, which sadly includes the poorly designed neck joint: it's supposed to be a balljoint, but it moves like a swivel. Part of the character's design is a large cape that attaches to his arms and legs, like a glider or something. 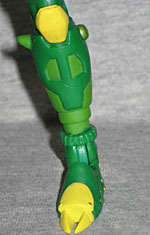 For this toy, it's made from a very flexible material (rather like ML7 Vision's cape), so it doesn't impede the movement at all. He's posed with his arms spread wide in the package (which has slightly warped the left elbow on mine, but it's certainly not the worst ever seen in this line), but you can change that easily. About the only thing you'll have trouble with is crossing his arms in front of his chest, and how likely is that to be a problem? 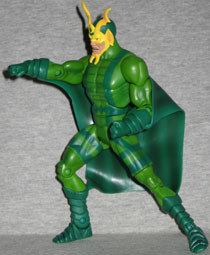 For whatever reason, a lot of the Fourth World characters were redesigned for the 1980s Super Powers toyline, and Mantis was one of them. His story was still the same - according to the promotional text - he just had a different look. Vastly different. Robot Mantis stands taller than the average DCU figure, at 6¾". You'd be hard-pressed to recognize it, but that's a normal re-used body under all that junk! Everything between elbows and knees could have come from any small male in the line; it's just been covered with large add-on pieces of "armor" that fit over the existing sculpt. The chest, waist, even the thighs? Yeah, it's all just slipped over the sculpt you're familiar with. The new forearms and lower legs look like they've been misassembled. You'd think the spikes would go on the outside of the limbs, right? Nope. If you look at the old Super Powers toy, you'll find it's the same way. Think biologically, and you can figure they're not spikes to ward off predators, but to help capture prey: imagine him jumping on Orion from behind, wrapping his arms and legs around the New God and sinking the spines in to help him hold on while he drains energy, and suddenly the placement of the points doesn't seem so odd. The only articulation of note on this figure (ie, breaking from the norm) are the ankles. There's a hinge connecting the foot to the shin, and a hinge "rocker" joint inside the foot. However, there's also a bit of swivel in there, as well - you can twist the foot side to side, pointing the toes different directions. It may just been some wiggle room in the sculpt, but you can get about 45° of movement from the joint, and that's not something any other DCU figure has ever been able to say. Paint is good on this Mantis as well, despite the much more complicated apps required. There are not only light and dark greens bumping up against each other, but several yellows and dark orange eyes. The rivets holding the robot together get individual apps, and there are two silver prongs poking forward from either side of his filter-shaped "mouth." 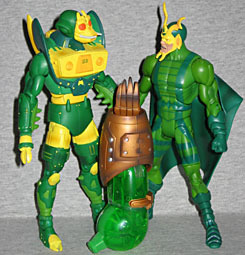 Some of the yellow sections even get a attempt at shading, which keeps Mantis from looking "toyish." 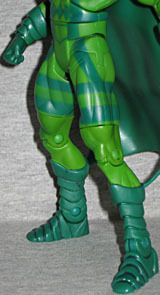 Both figures come with the same BAF Chemo piece: the left arm. It's 5" tall, and is actually twisted around a bit in the package, with the peg that will eventually fit into the torso pointing the wrong direction. Thankfully, the fact that there's a swivel joint in the elbow means you'll be able to correct it easily. Mantis isn't a famous DC character, by any stretch of the imagination. I'm a huge geek, used to work in a comicshop, and I'd still never heard of him until Rustin reviewed the JLU version a while ago. Both versions are well made, but having no loyalty to the character, I'd recommend the robotic version. It may not be the version you'd see in the comics, but it has a lot more to offer than yet another featureless repaint. Then again, that cape is pretty cool.